You have to admit, he does present a compelling argument. Too bad he's not a senator, that answer might actually work. He got his point across. South African words right there. when I saw this, 2 things ran through my head. 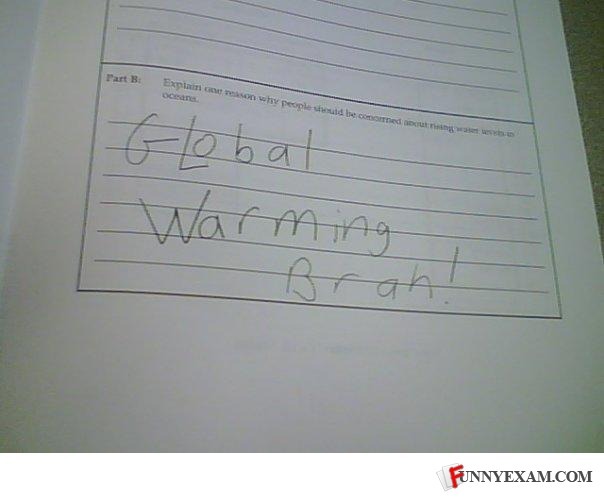 1) This is Al Gore's science paper. just saying, he almost flunked out of science school. 2) He is mentally insane if he wrote it like that! wait. THAT'S A GIRL'S HANDWRITING! Lmao next is gonna be Newtons Theory Brah! Or maybe Science Brah! A three-word arguement is sometimes the best one. That guy's gonna be a poliician when he grows up. OK, WHOEVER SAID, "WELL, AT LEAST I KNOW WHAT BRAH MEANS" IS IMMATURE! I think it deserves an A!